It’s been some years since I last attended FOSDEM, and I kinda missed it. I was eager to participate again, yet a bit frightened at the perspective of having to run or miss so many interesting talks happening in parallel as always. Nevertheless it was comforting to know Olivier was here as well, and we attended different sessions. After the opening session, the first troll^Wtalk was about systemd, or rather mostly about the DNSSEC implementation in systemd, and helped get into the mood. I also had 3 accepted talks so of course slides to prepare up to the last minute. But that was the occasion to reach different audiences since they all were in a different devroom. One was about our package management system, which I think could inspire some GNU/Linux distros (although I recall some obscure distros which actually also had this idea of mounting package contents virtually some years ago). Another one detailed the various toolkits ported (or not) to Haiku that people can code with. And the last one was a kind of “thank you BSD for all you gave to us”. For each talk I had quite a bit of people, and several questions at the end, so I suppose at least some of them were interested enough to consider testing Haiku. I’m not sure we’ll see a difference in the download stats, but who knows. Not having a booth (just because I missed the deadline) actually gave me the time to see quite a lot of other interesting talks, some related to the subject I discussed in mine regarding Haiku. There was a session about GUIX, a Scheme-based functional package manager, which has some similarities with our own solution (like, their packages are immutable). I missed part of the talk about FreeBSD graphics drivers, but arrived just in time to see mentioned “linuxkpi” which is their own version of “let’s emulate someone else’s kernel to run their drivers”, which we could probably have a look at for Haiku. Another interesting talk was one about standardizing boot on armv7 U-Boot, which of course was only about Linux, at least until I raised the question of other platforms. Basically they want to reuse the SYSLINUX config file syntax to help U-Boot propose a boot menu instead of having to type in commands with addresses in hexadecimal and other non-userfriendly stuff. 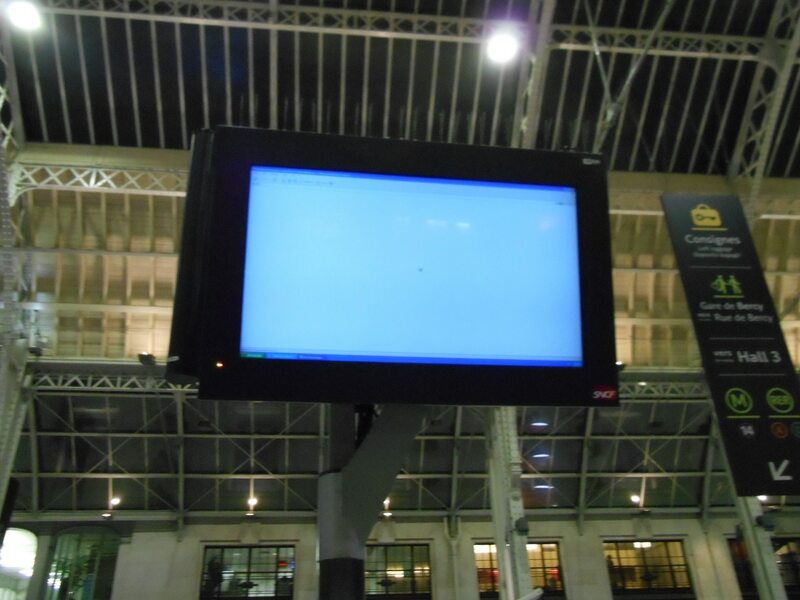 I’ll definitely need to keep an eye on that and propose things we need (like passing framebuffer configuration). There was a talk about the VirtualBox Guest Additions and how to package it better in the future, as most distributions now ship with outdated versions, and having to install the latest ones from an ISO image could conflicts with those, and is not the best user experience. I missed the talk about MIPS, but I suppose I have enough targets to look at for the time being anyway. I was interested in learning more about LLVM as well, but I guess I’ll wait for the rerun. I won’t know “The State of OpenJDK”, apart that it currently crashes in the NetBeans install script on Haiku at the moment. The “How to design a Linux kernel API” speech was probably funny, I’ll put it first on my watch-list! There was a ReactOS booth along with the usual distro ones, so I passed by to thank them for representing alternative systems. In the other stands we had Perl, with an almost life-sized replica of their mascot, and they were selling Perl-branded wine. We also had one for Mozilla of course, which I didn’t have the time to stop by for some trolling. There was even some people from Google giving information on the Summer of Code and Google Code-In projects, so hopefully we’ll get even more interested students next time. In the AW building were located yet some other stands, like one showing off the Minnowboard, and the Coreboot / Flashrom booth. Which reminds me I still have to finish my Flashrom port. I wanted to attend the KiCAD talk (we would need to get wxWidgets to port it btw), but the room was full and the queue extended to the bottom of the stairs at least. At the LibreOffice booth we discussed the Haiku port again, hopefully someone will take the time to finish that. The taker might want to look at the record of the “Visual Class Library” talk that was given this year. I also discussed hardware specifications with some FSFE fellows, and several other topics. As I had to leave for my train, I left Olivier and missed the closing talk, I wonder if everyone jumped for the FOSDEM dance. I can’t believe it’s already finished. 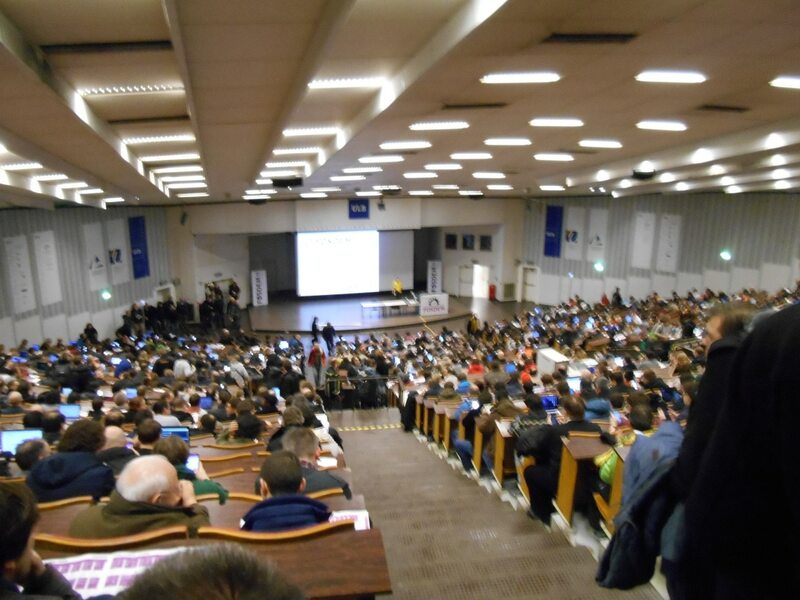 Once again, this edition of FOSDEM was dense and interesting, and hopefully will bring us some more contributors! In less than two months I’ll be at the Haiku booth for the JDLL in Lyon. As I’m not sure there will be anything more than the security track organized for RMLL this year, I’ll be more than ever looking forward to the next FOSDEM.